SEATTLE, USA, July 1, 2016 /EINPresswire.com/ -- Everyone has days when everything seems to go wrong and help is needed to pull the socks up and struggle on. Author Devin Metzger has just released “Highly Quotable: 4000+ Quotes to Motivate and Inspire You” for Kindle and in paperback, available now on Amazon. It is a compilation of over 4,000 quotes from visionaries, philosophers, entertainers and politicians which can help brighten a gloomy day. Depressing days darken the lives of most people, and it is often hard to find a little sunshine. Browsing this book should result in finding several thoughts to help difficult times seem better. Devin Metzger describes himself as a new media and social media junkie who spends most of his time reading and writing about these two major players on today’s stage. 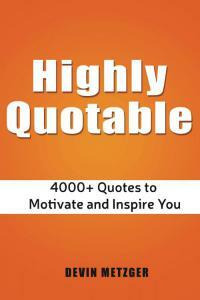 For information about “Highly Quotable: 4000+ Quotes to Motivate You and Inspire You”, visit http://coapublishing.com/book/highly-quotable-4000-quotes-to-motivate-and-inspire-you/.